We are in the wettest place on earth, and we will know it! Last evening we already heard raindrops falling on the roof of our hotel and this morning it is still grey and gloomy. This doesn’t spoil our mood as we look forward to the trek that we have in prospect for today. 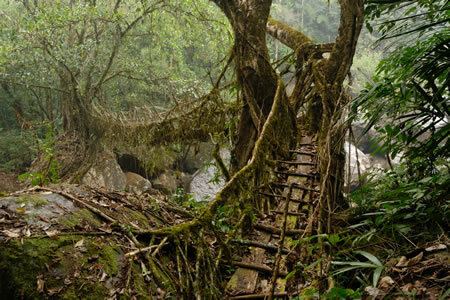 Today, we want to visit the unique root bridges. To get to those bridges we need to walk approximately 20 kilometres and during this hike we need to descent and ascent approximately 700 metres. The travel guidebooks mention that it is a highly strenuous hike, even for the fittest trekkers, so we are warned. After breakfast, we start to walk at 08:00 am and the weather seems to brighten up. That isn’t very remarkable as the dry season (non-monsoon season) isn’t that wet on the wettest place on earth. While in some monsoon months more than 3,800 mm rain falls, January often gets less than 10 mm and in some years not even a single raindrop falls in this month. When the sun breaks through the clouds, we praise the weather gods and pack our rain jackets in our daypacks. The first part of the hike brings us from Laitkynsew to Mawshamok, from where we continue to follow the paved road to Tyrna. When you have a car available, you can get to Tyrna by car to shorten the hike. However, these 5 kilometres from Laitkynsew to Tyrna are nice and relaxed to walk. A good way to get your muscles warm for the descent that lies ahead. At Tyrna we leave the paved road and this is the start of the descent to the root bridges. These bridges are made of the roots of the Indian Rubber Tree (Ficus Elastica) and these flourish in the lower regions of the Khasi and Jainti hills. There it is warm and humid and this Ficus Elastica grows in large numbers on the shores of the many rivers that run through the jungle. To reach these lower regions, a footpath is created on the steep hill slopes. The first part of the footpath consists of concrete steps. The villages that we pass are picturesque and the footpath through the jungle looks so neat that it almost seems as if we are walking in a botanic garden. After a while, the concrete steps end and from that moment the path consist of a stair made of rocks. This stair of rocks looks better and has more charm but it has one important disadvantage that we will come to know soon: due to the rain of this night, the stairs are as slippery as glass. We slither our way down the path and after a while we follow the advice of an older man that we met. We take a few “walking sticks” out of the jungle and this extra support helps us getting down. Unfortunately, the weather is turning grey again and we hope that it stays dry. Due to the slipperiness, it takes us one and a half hour to descent to the village Nongthymmai. Nongthymmai is a small village, with a big living root bridge. It is said that this is the largest root bridge on earth, and it is definitely the longest that we will see today. After some searching we find this beautiful bridge and while we had high expectations on forehand, it exceeds our expectations. On both sides of the river are two massive Indian Rubber Trees. These trees have roots that can cover big distances above the ground before they go into the ground or river to collect the necessary nutrients for the tree. 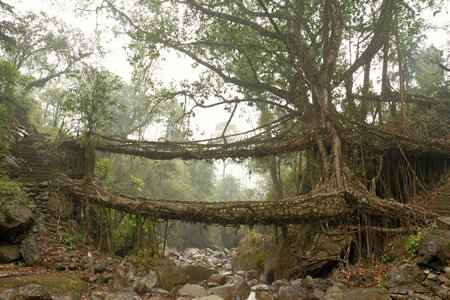 Approximately 150 to 200 years ago, a few people had the ingenious idea to use these roots to create a living bridge. With pieces of wood they made sure that the roots grew in the right direction. Because these trees get a lot of roots at the side of the trunk, also arm railings could be created for the bridges. Stones were put on the bridge “floor” to fill the holes between the different roots. After a while, the roots grew around those stones in a way that the stones became part of the bridge which enhanced the strength of the bridge. For us visitors, it doesn’t matter that much how those bridges were made. The sight on those bridges is like looking in a beautiful illustrated fairy tale book. It is just marvellous. After observing the bridge for a while from a distance, it is time to test it. It is said that there are root bridges that can carry over 50 persons, but we start our first root bridge crossing very carefully. At first, it is a strange feeling but after a few seconds you really feel that the bridges are very sturdy and it is reassuring to see that some of the roots have a crosscut of more than 10 centimetres. This bridge deserves to be photographed and that is exactly what we do. Unfortunately, it starts raining when we are looking for the perfect picture spot, but that doesn’t spoil the moment. After seeing the root bridge, we know what we are doing it for. After a while, we walk further to look for the double-decker root bridge. This is the most famous bridge because it has two layers. To reach it, we have to walk another half hour in which we cross two bridges made of steel ropes. These bridges are probably stronger than a root bridge, but it doesn’t feel that way when you feel the steel ropes slip under your feet. During this “dry” season, the rivers that we cross aren’t that big and wild, but in the monsoon season it must be very strange to use such a bridge to cross a thundering, swirling river. We pass a few smaller root bridges and then we see the double-decker root bridge. To fully enjoy the root bridge, we sit down at a nice place out of the rain where we observe it silently for half an hour. It looks so magical that we would almost think that the singing and laughter at the background comes from dwarfs. However, it appears to be a group of children from a village nearby that has faced the rain to come to us to practice their English. The people in this region don’t see that many Western tourists and are very friendly. They don’t see you as a walking wallet and don’t try to sell you all kinds of things. There isn’t even some food to buy to refuel yourself for the way back. As we didn’t thought of that on forehand, we have to fulfil the return journey with a rumbling tummy. Time has gone fast because of the slithery descent and the many long picture stops. Because we want to be back in the hotel before dark, we skip the 20 minute walk to the natural swimming pools and another steel rope bridge. At 13:45 we start walking back in the pouring rain. The stairs made of rocks isn’t as dangerous when ascending, but it is still tricky. Fortunately, we keep our balance and at 15:30 we are back in Tyrna. We are soaking wet and that isn’t just because of the rain but mainly thanks to the amount of sweat that we spilled. After taking a small rest under the lean-to roof of the village church, we walk back to Laitkynsew. There waits a nice hot shower. A very good end of what was a wet, tiring but above all a magically beautiful day.